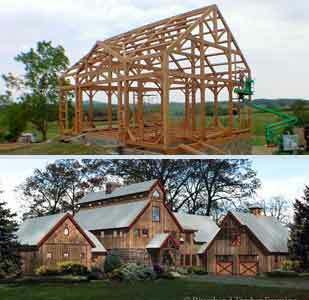 As part of the natural landscape of a working farm or as the centerpiece of an equestrian center, the timber frame barn has historic and architectural distinction. Riverbend is proud to carry on this tradition with the amazing barns we have built over the past 30 years. You may need an indoor arena for your horse property or a livestock barn for your farm. Choosing to build a Riverbend timber frame structure will add to the character and enjoyment of your space for generations to come. For many who love the look of barns, they dream of living in a home that captures the style. A few weeks ago, Riverbend introduced a new floor plan concept, the Lancaster, which is just one example of how we can design a barn-style home for your family.